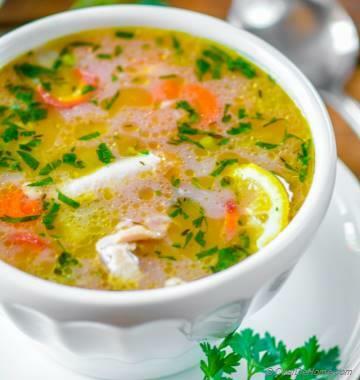 All Cracked Wheat or porridge recipes are nutritional and diabetic friendly, the one I am sharing with you today also has bonus proteins from yellow lentils. 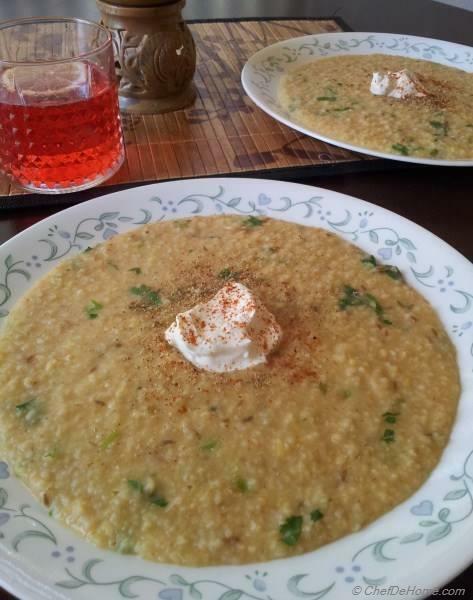 Actually, I should admit that lentils also enhance the taste and texture of porridge. For those, who are new to porridge, Cracked Wheat is called Porridge when cooked in water or milk till it is fully cooked and has oats in milk like consistency. Cracked Wheat is most simple ingredient to cook with; but few of my friend complaint that they can never evenly cook porridge. So, I will share with you a little secret later to help you cook cracked wheat more evenly and quickly. Porridge is commonly associated with breakfast in nay European countries. 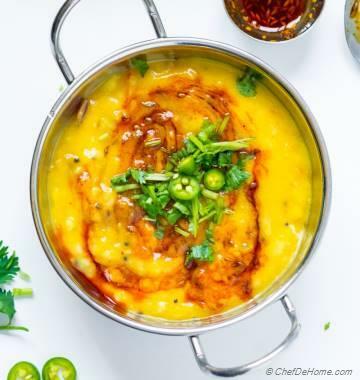 Hence, mostly people eat porridge for breakfast, but in my home, we even enjoy it for lunch with side of pan roasted veggies or a small arugula salad. Eat it whatever way you like, this wholesome wholegrain will help you lower cholesterol and control glucose spikes too. 1. 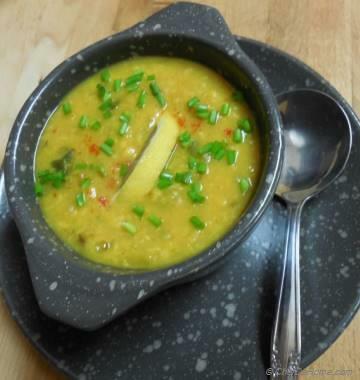 Wash the yellow lentil under open water till water runs clear and set aside. Now, heat oil in deep pan or pressure cooker without lid. 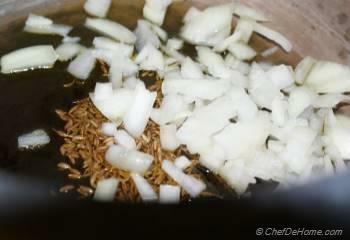 Add cumin seeds and onion and saute till onion are translucent. 3-4 minutes. 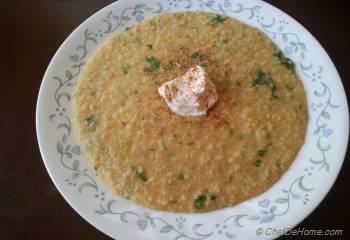 I have used pressure cooker to cook porridge which mostly take 15 minutes including time to roast porridge. If you prefer to boil then it will take about 25 minutes to roast and cook. 2. 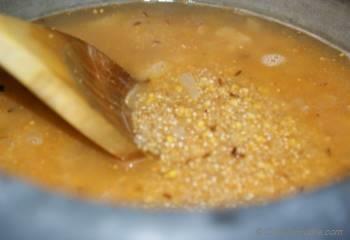 Add cracked wheat and continuously stir wheat to pan roast it. This step is very important, if cracked wheat is not roasted properly, it takes much longer time to cook and is tough to eat. 4. Add lentils and 3 cups of water and 1 tsp salt. Stir to combine. 6. 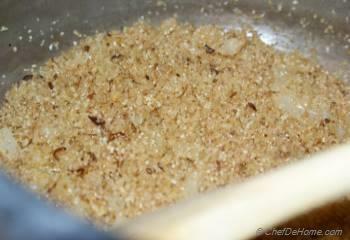 Remove cooked crack wheat or porridge from heat. Add black pepper and chopped cilantro. 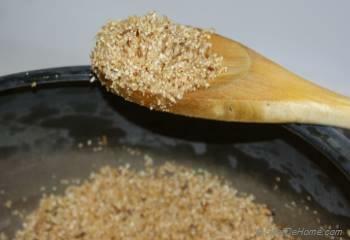 Serve immediately as cooked cracked wheat absorbs water as it sits. Add some yogurt, sprinkle some pepper and enjoy most healthy whole wheat breakfast on the planet. 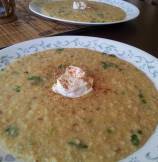 I always serve savory cracked wheat with yogurt on the side, no specific reasons just for taste and some cooling affect with hot porridge. However, for vegan diet, replace yogurt with glass of almond milk or orange juice.